Those in favor of a flexible work environment make a strong case that allowing workers to spend less time in the office during the summer months increases morale, and thus helps reduce employee turnover. Further, 86 percent of companies listed on Fortune’s 2014 “Best Companies to Work For” report offer flexible schedules and more than one work at home day per week. Companies, in other words, that offer flexibility to workers are more likely to attract top talent. As an employer, however, you are torn about whether allowing employees to work at home would be a positive move, or one that would reduce focus and encourage slacking off. After all, you have a business to run and a bottom line to maintain. So, how can you offer more flexible summer hours without sacrificing the high demands that you place on your workers? The answer is by investing in an advanced video conferencing services solution like Onstream Meetings, which offers a variety of different conferencing solutions (i.e. text, video and audio chat), real-time screen sharing and a multimedia content library capable of delivering streaming content on demand. By providing your workers with such a service, you can ensure that workers have access to all of the same communications and collaborations tools while they are on the go as they do when they are in the office. Act now before summer comes, so that you have an online meetings solution ready to meet all of your video conferencing needs. 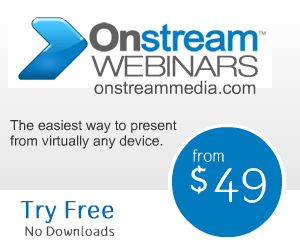 Click here to compare plans from Onstream today!